Adam Dunn’s agent, Brian Peters, tells Jon Heyman of CBS Sports (Twitter link) that Dunn is indeed retiring, as was widely expected. Dunn himself said that he would retire following the season back in August, though he created a bit of doubt when he backed off slightly and said, “That’s it, probably,” following the Athletics’ loss to the Royals in the AL Wild Card game. Dunn’s career was unique, to say the least, as he epitomized the “three true outcomes” player, homering 462 times while striking out in 28.6 percent of his plate appearances and walking in 15.8 percent of them. Just under half (49.9 percent) of Dunn’s career plate appearances ended in a long ball, a walk or a whiff, and he will enter the record books with a .237/.364/.490 batting line. Dunn hit 40-plus homers in six separate seasons, including five consecutive years — four of which finished with 40 on the dot (2005-08). The “Big Donkey” will be fondly remembered by many for his light-tower power — a skill that earned him more than $112MM throughout his career, per Baseball-Reference.com. MLBTR wishes Dunn and his family happiness and the best of luck in his post-playing days. Athletics right-handers Jarrod Parker and A.J. Griffin are doubtful for Opening Day, tweets Jon Morosi of FOX Sports. That’s not a huge shock, given that both underwent Tommy John surgery last spring, though Parker, whose surgery was on March 25, would have seemed to at least have a chance at being ready. Oakland still has plenty of pitching depth, however, with Sonny Gray, Scott Kazmir, Jesse Hahn, Jesse Chavez, Drew Pomeranz, Chris Bassitt, Sean Nolin and Kendall Graveman all in the fold. Once Griffin and Parker are healthy, Oakland will have a plethora of MLB-ready rotation options, and only Kazmir is set to depart following the 2015 campaign. Morosi also tweets that the Diamondbacks have received calls from the Orioles regarding their outfield depth. Baltimore is known to be looking for a left-handed hitting outfielder, and both David Peralta and Ender Inciarte would fit that description, Morosi notes. Peralta’s name has surfaced in trade talks already this offseason, as the Reds were said to be interested in him prior to acquiring Marlon Byrd. Moving Peralta would allow Arizona to shift Yasmany Tomas to the outfield rather than trying him at third base, as is the current plan, although first-year GM Dave Stewart specifically mentioned Peralta when discussing the club’s strengths shortly after his hiring. Also from Morosi, the D-Backs have called the Blue Jays about Dioner Navarro, but talks haven’t advanced much to this point. Morosi noted last night that Arizona is working hard to acquire a catcher, as Tuffy Gosewich is the lone player on their 40-man roster with big league experience. Navarro is known to be available after the Jays inked Russell Martin to a huge five-year deal earlier this offseason. The Giants tried to work out a deal to acquire Ben Zobrist from the Rays before he was dealt to Oakland, but San Francisco deemed Tampa’s asking price to be too high, tweets Nick Cafardo of the Boston Globe. The Mariners are one option for veteran outfielder Endy Chavez, tweets Heyman. Soon to be 37, Chavez remains on the free agent market on the heels of a season in which he batted .276/.317/.371 (99 OPS+, 97 wRC+). While Chavez has never brought much to the table in terms of offense, he’s graded out well from a defensive standpoint throughout his career (though defensive metrics have soured on him over the past two seasons). OCTOBER 1: After last night’s difficult loss, Dunn said he still intends to retire but did not slam the door shut entirely, as MLB.com’s Jane Lee tweets. “That’s it probably,” he said. SEPTEMBER 1: Dunn kept the door slightly open for a 2015 return, telling Susan Slusser of the San Francisco Chronicle (Twitter link) that he only said he will “probably” retire following the season. He has no intention of continuing his career to chase the 500-homer mark unless he’s on a contending team. AUGUST 31: Adam Dunn says he will retire after the season, Bruce Levine of 670theScore.com tweets. The news comes in the wake of the slugger being traded to Oakland, and comes as no great surprise — he’s in the last season of his $56MM contract, and he’s discussed the possibility of retiring before. He’s also 34, and his best days as a player seem to be behind him. He remains a prolific power hitter, with 20 home runs in 435 plate appearances this year, and he’s always drawn more than his share of walks. But his batting average has fallen to very low levels — he hasn’t batted above .220 since 2010. And his defense, while never good, has gotten so poor that he’s a liability anywhere other than DH, even considering his obvious offensive skills. Nonetheless, Dunn will leave behind an impressive body of work, and his extreme homers/walks/strikeouts offensive game makes him an historically unique player. He has 460 career home runs (good for 36th all-time), including at least 38 in seven consecutive seasons from 2004 through 2010. He’s also drawn an impressive 1,311 walks in his career, fourth among active players (behind Bobby Abreu, Jason Giambi and Manny Ramirez). Of course, he’s been one of the game’s most frequent strikeout victims — five of his seasons are in the top 20 all time in strikeouts, and he ranks third all-time in whiffs, behind Reggie Jackson and Jim Thome. Dunn made his mark on Major League pitching immediately, finishing fourth in NL Rookie of the Year voting in 2001 (despite only playing half the season in the bigs) and emerging as a poster boy for the sabermetric movement with his “Three True Outcomes” (homers, walks and strikeouts) offensive style. He then blossomed into one of the game’s most feared power hitters as an outfielder and then a first baseman with the Reds, Diamondbacks and Nationals. There could finally be some movement on the new ballpark front for the Rays, according to a report from John Romano of the Tampa Bay Times. A deal is in the works between the team and the city of St. Petersburg that would enable exploration of possible stadium sites. Any resolution would appear to be a long way off, but Romano explains that this is an important first step towards the sides working together on the matter. The moves to acquire soon-to-be free agents Brandon McCarthy, Chase Headley, and Stephen Drew were obviously designed to bolster the Yankees’ chances this year, but had a side benefit looking forward, writes Mark Feinsand of the New York Daily News. In the cases of the former two players, says Feinsand, the brief audition has shown both sides that a longer commitment could be beneficial. As for Drew, his poor showing since heading to New York now makes him an unlikely candidate to take over for Derek Jeter at short in 2015, according to Feinsand. The balance of power in the AL West has swung heavily in the Angels’ direction after the Halos completed a four-game sweep of the Athletics on Sunday. Los Angeles now own both baseball’s best record (83-53) and a five-game lead over the struggling A’s, who are looking for answers after an 12-17 August. Oakland is still on track to reach the postseason, as they hold a four-game lead in the AL wild card race. The A’s will cover $1MM of the roughly $2.3MM remaining on Adam Dunn’s 2014 salary, and ESPN’s Buster Olney tweets that Oakland’s willingness to take on this much of Dunn’s salary was part of the reason why the A’s were able to acquire the slugger. The Giants, Dodgers and at least one other team were also reportedly talking to the White Sox about a Dunn trade. Astros manager Bo Porter tells Fangraphs’ David Laurila that his relationship with Houston’s front office “is what he expected coming in,” which seems to counter recent rumors of tension between Porter and GM Jeff Luhnow. “My staff and I take all the information from our baseball ops and use it to the best of our ability. Every last component of that is needed to be successful,” Porter said. Also from Laurila’s piece, 37-year-old lefty Joe Beimel not only has no plans to retire, his 12-year career might only be half-over. “I plan on pitching until I’m at least 50….I don’t see any reason I can’t do what Jamie Moyer did,” Beimel said. “He was starting games at 49 years old and getting guys out with 80 mph. I’m not down that low yet and I figure if he could go six, seven innings, I could at least come in and get one or two guys out.” After missing 2012 and 2013 due to Tommy John surgery, Beimel is enjoying a nice comeback year out of the Mariners’ bullpen. The veteran southpaw has a 2.03 ERA, 5.2 K/9 and 1.92 K/BB ratio in 40 innings, and he’s held left-handed batters to only a .480 OPS. 3:08pm: The Athletics will pay just $1MM of the $2.3MM remaining on Dunn’s contract, Slusser tweets. 10:45am: Dunn will join the A’s tomorrow, Susan Slusser of the San Francisco Chronicle tweets. 10:38am: The A’s have acquired Adam Dunn from the White Sox in exchange for minor league pitcher Nolan Sanburn, the team announced. Though the A’s were on his limited no-trade clause, word broke this morning that Dunn, who has never played in the postseason, was willing to waive that clause in order for a chance to win. Dunn, 34, is hitting .220/.340/.433 with 20 homers on the season, and his numbers against right-handed pitchers are even better: .232/.357/.457 with 18 homers. The hope for the A’s is that adding some left-handed pop can help to spark an offense that has gone dormant in the month of August. Though the A’s still lead the Majors in total runs scored, they’re hitting just .248/.324/.394 this month and they’re tied with the Phillies for 20th in runs scored this month at 102. Many fans attribute those struggles to the decision to trade Yoenis Cespedes, and in Dunn, Oakland will receive a hitter whose wRC+ of 114 is similar to the 113 mark posted by Cespedes. Those offensive struggles for the A’s have been a significant factor in the team’s fall from atop the American League West. They’ve had a particularly difficult time scoring runs against the now-division-leading Angels, as Anaheim has outscored the A’s by a score of 10 to three thus far in their four-game series. Oakland has been shut out in each of the past two contests against the Halos and has fallen to four games back in the division. They are still, however, in position to finish as one of the Wild Card winners. John Jaso has served as Oakland’s left-handed DH quite a bit this season, but the A’s recently placed Jaso on the seven-day disabled list due to concussion-like symptoms, and they’ve been mixing and matching with Brandon Moss, Coco Crisp, Derek Norris and Gomes of late. Crisp, however, has recently re-strained his neck, which could lead to more outfield time for Moss, especially if Crisp is out for a significant amount of time. Dunn is earning $15MM in the final season of a four-year, $56MM pact with the White Sox, meaning he is owed about $2.54MM for the month of September. Presumably, that salary commitment and Dunn’s well-documented defensive limitations allowed him to clear waivers. This marks the fourth significant trade of the summer for the A’s, who have acquired Sam Fuld, Jeff Samardzija, Jason Hammel, Jon Lester and Jonny Gomes in other deals. In Sanburn, the Sox will acquire a right-hander that ranked 12th on MLB.com’s midseason list of top 20 Athletics prospects. The 23-year-old was Oakland’s second-round pick back in 2012 and has pitched to a 3.28 ERA with 9.2 K/9 and 3.2 BB/9 in 71 1/3 relief innings at Class-A Advanced this season. He’s finished 23 games and picked up six saves in his time at Stockton. Sanburn has been plagued by some shoulder issues, but he also has less mileage on his arm than many pitching prospects due to the fact that he was an outfielder in college and for part of his time in college at Arkansas. Jim Callis and Jonathan Mayo of MLB.com note in their free scouting report that Sanburn touched 99 mph in college and offers a curveball with good depth as well. The MLB.com duo notes that Sanburn has a promising slider and changeup as well, but concerns over his durability have led to a bullpen role this season in Oakland. Tom Verducci of SI.com first reported that the A’s were pursuing Dunn. Ken Rosenthal of FOX Sports tweeted that the A’s were the front-runners to land him and that Dunn would waive his no-trade clause. ESPN’s Buster Olney first tweeted that the A’s were closing in on a deal for Dunn. 9:30am: The A’s are closing in on a trade for Dunn, Olney tweets. 9:00am: The Giants are no longer a potential landing spot for Dunn, according to Olney (Twitter link). 8:45am: Rosenthal tweets that the A’s are the front-runners to acquire Dunn, who is willing to waive his no-trade clause to facilitate a trade to Oakland. 8:34am: The Giants, A’s and one other club are pursuing Dunn, Rosenthal further reports (Twitter links). Oakland is indeed on Dunn’s no-trade list, but Dunn will consider allowing a trade for a chance to win in the postseason, he adds. Meanwhile, ESPN’s Buster Olney hears that the Dodgers are still in discussion with the White Sox on Dunn (Twitter link). 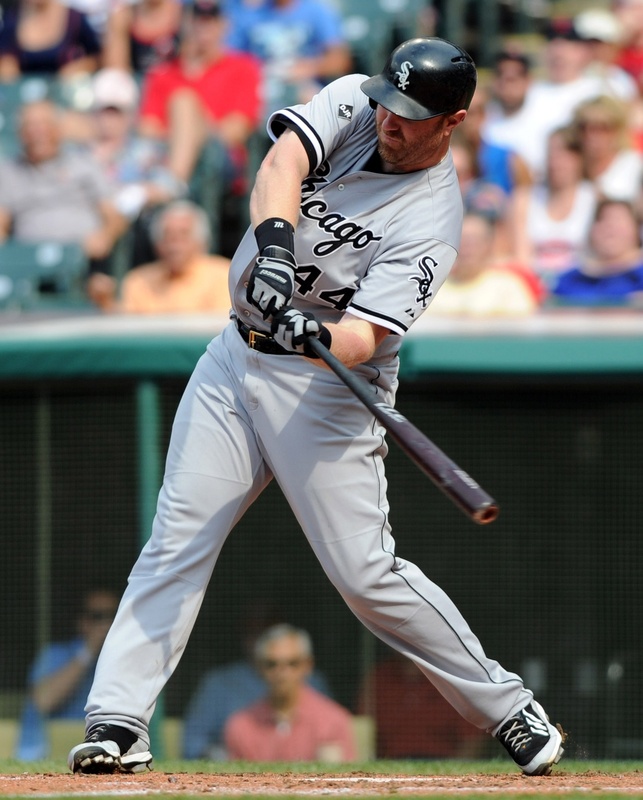 8:31am: The Giants and A’s are both looking to make a late trade for White Sox slugger Adam Dunn, reports Tom Verducci of SI.com. Ken Rosenthal of FOX Sports tweets that there was a lot of chatter yesterday that Dunn could be moved in advance of the Sept. 1 deadline for postseason eligibility. Rosenthal also notes that Dunn has a limited no-trade clause, and while the teams on that list aren’t known, Oakland frequently finds itself listed on players’ no-trade clauses. However, as Verducci notes, Dunn leads all active players in games played without a postseason appearance, and he’s also discussed the possibility of retiring after the season. With those factors in mind, it’s hard to imagine Dunn blocking a trade to a team with a good chance of providing him with the first playoff experience of his 14-year career. Players acquired via trade after Aug. 31 are not eligible for their new team’s postseason roster, making today somewhat of a soft trade deadline (we of course have seen trades take place after Sept. 1). As such, it wouldn’t be a shock to see Dunn (and/or others) on the move, and the White Sox certainly aren’t averse to trading veterans, having just dealt Alejandro De Aza to the Orioles last night. While there haven’t been reports on Dunn clearing revocable trade waivers, his $15MM salary and defensive limitations both make him a candidate to clear waivers. If that has happened, he’s free to be dealt to any team, and that would certainly seem to be the implication in Verducci’s article, as he notes that the Dodgers also inquired on Dunn but aren’t considered a fit. The “Big Donkey” is owed about $2.54MM in September, so Chicago GM Rick Hahn could sweeten a potential trade by offering to pay some or all of Dunn’s remaining salary. Dunn hit his 20th homer of the season yesterday and has posted a .220/.340/.433 batting line on the season as a whole. His platoon issues have been building for years, and they’re very apparent in 2014, as he’s hitting just .154/.274/.288 with two homers against southpaws and .232/.351/.457 against righties. 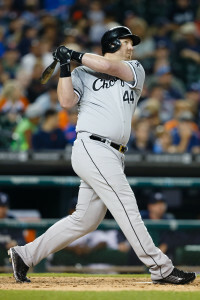 Dunn could be used as a bench bat for the Giants and perhaps a platoon option at DH for the A’s. Clearly, he could play a bigger role in Oakland than in San Francisco, and for what it’s worth, John Shea of the San Francisco Chronicle tweets that A’s GM Billy Beane has told him that he “loves” Dunn in the past. Milwaukee's trade of Norichika Aoki to the Royals makes sense for the Brewers and for Aoki himself, MLB.com's Adam McCalvy writes. Khris Davis' emergence late last season means there won't be room for Aoki as a full-time player now that Ryan Braun's suspension is over, as the Brewers will go with an outfield of Davis, Carlos Gomez and Braun. Aoki's path to playing time will be clearer in Kansas City. "Everybody was on board with it," says Aoki's agent, Nez Balelo. "[Kansas City] was the best viable option. He’s going to love it there because he will get an opportunity to lead off and play every day." Here are more notes from the Central divisions. Royals infielder Christian Colon has switched agents from Scott Boras to Excel Sports, tweets Jerry Crasnick of ESPN. The Royals and Angels might make good trade partners, with the Angels sending second baseman Howie Kendrick to Kansas City in return for young pitching, the Los Angeles Times' Mike DiGiovanna tweets. Phil Hughes was surprised to receive a three-year, $24MM deal from the Twins, Mark Feinsand of the New York Daily News reports. "Obviously the season I had was a disaster," says Hughes. "Coming into this thing, I was kind of expecting to just rebuild my value with a good year next year somewhere." The Mariners and Angels were among the other teams who bid for Hughes, but the Twins' offer of three guaranteed years won out. Now that the White Sox have signed Jose Dariel Abreu and re-signed Paul Konerko, there's less playing time available for Adam Dunn, writes CSNChicago.com's Dan Hayes. It appears Konerko and Dunn will platoon, with Konerko starting at designated hitter against lefties. Dunn hit .226/.327/.459 against righties last year, compared to .197/.296/.385 against lefties.